This sketch was made by Joseph Severn as he watched over the dying poet at 26 Piazza di Spagna, Rome. Keats passed away on Friday, 23 February 1821, around 11:00 pm. This is the last known portrait of the poet. He is gone–he died with the most perfect ease–he seemed to go to sleep. On the 23rd, about 4, the approaches of death came on. “Severn-I–lift me up–I am dying–I shall die easy–don’t be frightened–be firm, and thank God it has come!” I lifted him up in my arms. The phlegm seemed boiling in his throat, and increased until 11, when he gradually sunk into death–so quiet-that I still thought he slept. 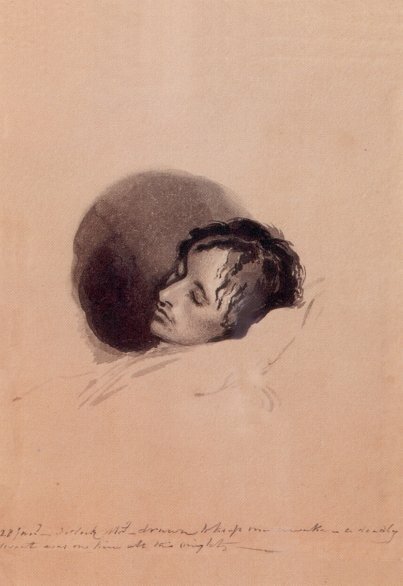 I cannot say now-I am broken down from four nights’ watching, and no sleep since, and my poor Keats gone. Three days since, the body was opened; the lungs were completely gone. The Doctors could not conceive by what means he had lived these two months. I followed his poor body to the grave on Monday, with many English. They take such care of me here–that I must, else, have gone into a fever. I am better now–but still quite disabled. The Police have been. The furniture, the walls, the floor, every thing must be destroyed by order of the law. But this is well looked to by Dr C.
The letters I put into the coffin with my own hand. This goes by the first post. Some of my kind friends would have written else. I will try to write you every thing next post; or the Doctor will.